Cardinal flower is a clump-forming herbaceous perennial native to North America where it grows in moist to wet areas such as stream and river banks, pond edges, marshes and swamps in eastern and southwestern US, Mexico, and Central America to northern Colombia. It is a member of the bellflower family, Campanulaceae, that also includes balloon flower (Platycodon), and ladybell (Adenophora). The common name, cardinal flower, refers to the bright red garments worn by Roman Catholic cardinals. Description: Dark green lance-shaped leaves are rough textured, three to six inches long and borne on unbranched hairy stems. Vivid red tubular flowers are produced in racemes twelve to eighteen inches long and are attractive to hummingbirds and butterflies. Each flower has two lips, the upper with two lobes, the lower with three lobes. Plants bloom in late summer into fall for four to six weeks. They are relatively short-lived but selfseed. 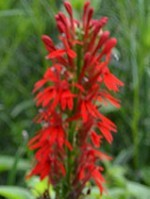 Cardinal flower is an excellent choice for a rain garden and naturalize well without becoming aggressive or invasive. 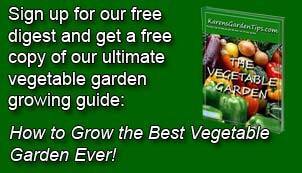 Cultivars varying primarily in color are available. Poisonous Properties: The cardinal flower plants contains a mixture of pyridine alkaloids, notably alpha lobeline, and all parts of the plant are consider poisonous. Symptoms of poisoning include nausea, vomiting, increased salivation, abdominal pain, diarrhea, coughing dizziness, visual and hearing disturbances, dilation of the pupils, headache, mental confusion, sweating, weakness, slowed heart rate, increased blood pressure, increased breathing rate, tremors, seizures, convulsions, collapse, coma, and death. Contact of the sap with skin may cause irritation. Although lobeline has been used as a smoking cessation aid and may help in the treatment of other drug addictions, there is little proof of its efficacy and the difference between a beneficial dose and toxic dose is so small that its use cannot be recommended.